Were you offended by the title of this post? Well, I wasn't; at first. 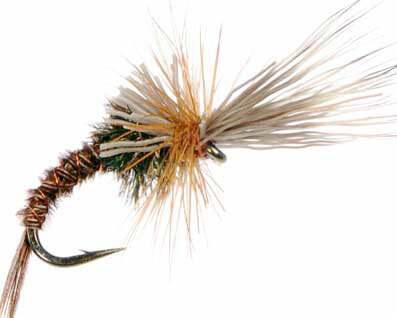 Don't tell Rosenbauer, but my favorite emerger pattern is the Quigley Cripple. It is an effective emerger pattern that mimics a Crippled Mayfly that trout seem to find appealing. But they should find it more appalling. Last evening I looked at the list of search terms that bring folks to my industry leading stumbled upon occasionally read blog and found the term "Challenged Emerger" as one that had led some poor fools readers my way. What's a Challenged Emerger? Google it. You'll find that it's the name of a new fly; new to me at least. So I got to thinking that it sure looks similar to a Quigley Cripple style that I tie and then it struck me -- political correctness has struck the fly tying game! Are all "Crippled" flies to be renamed "Challenged"? What rubbish! I am a fly angler by choice. I catch and release (mostly). I have a great deal of respect for the fish and fisheries that support my habit. But I think little of the foodstuffs that support the trout. I enjoy seeing a struggling mayfly get slammed by a hungry trout. Dead and dying mayfly spinners get me excited about the possibility of easy fishing. And don't get me started about the poor crippled challenged mayflies that will never have a chance to live a full life, swarm with the lasses and lads and find a mate; they're the finest of things to imitate mock. Am I this insensitive? Worse yet, am I one to mock them by tying flies that imitate their twisted, deformed visages and use them as bait to lure trout to the surface? So from now on I will tie no more emergers. I will not fish those I have but instead confer upon them the respect that is reserved for mayflies everywhere not just their full hackled brethren . Author's Note: For those of you with less finely tuned humor centers, this is sarcasm and satire with a hint of absurdity thrown in for good measure. It is not intended to be a reflection of my feelings on the human condition or anything else other than commentary on how idiotic it is to change the name of a fly pattern the mimics a maimed bug because the word cripple, the common term to refer to maimed mayflies, appears in its name. Well, this is indeed some food for thought. My own fly box contains three sizes of the *** ******** ****, at east two **** ***, and probably more, a deer hair ***** **** and another tied with synthetics. I love to fish a **** ****** if I need to fish below about four feet, and I'll even fish it as part of three-fly *****, if I'm not sure what the fish want. T.J., I'm encouraged by your comments that all fly anglers might revisit their thinking on the subject of physically disabled mayflies. What a bunch of crap. It's a fishing fly for God's sake. Now we're going to have to change all the good names we've established for our cool flies like "Red Naked Lady" to "Red Unclothed Lady". How about the "Egg Sucking Leech" I don't even want to go there. Sometimes they (who ever they are) need to take their political correctness and stick it where the sun doesn't shine. There goes that political correctness again. Hey, what can you expect from a guy that worked in a warehouse for 30 years. Send those challenged emergers my way Steve. I'll get rid of them for you! Great post. Your humanitarian efforts are laudable. As a person who works with people with disabilities, I can tell you that the radicals are the only ones that care. So Mayfly with disabilities, challenged mayfly or crippled mayfly. It's America, call it what you want...and send me a dozen. I'll dig around and see if I have some spares. It's your cigar smoke that bothers me. Disgusting. Which is why I stand upwind of you fishing to the trout to which you're casting. Splendid. Just splendid. It's nice here. Steve, I am with most of the other folks who commented here. Does it catch fish? Does it do what you intended it to do? Makes no difference what you call it if it reaps the reward desired. Reminds me of a guy who walked into the fly shop along the Henry's Fork one day in Idaho. Several anglers were sitting around talking about fly names in Latin. The guy who just walked in was asked if he could be helped. He responded, "I want some of those little gray suckers that are workin' on the river". So much, for what is proper! The little gray suckers are my favorites! Cripples no more! You have certainly just ascended to the next realm of fly fishing "Zen-ness"....good luck on your quest. All my flies will fly free on the wings of doves and swallows and other flying things. Be Free! Be Free!